Dehydration is a gradual effect. For every increment of fluid loss there is a small rise in your body temperature and heart rate, and an increase in the perception of how hard you are working. Skills and concentration are also impaired. In other words as the fluid deficit grows, there is a continual decline in performance. You may be unaware of small and subtle changes and may only recognise the damage when it becomes extreme. Optimal performance means being at your best, not just escaping serious problems. Minimising dehydration is one step towards optimal performance, particularly when you are exercising in hot weather. Ideally everyone should drink to keep pace with their sweat losses while exercising. This means replacing fluids throughout the period of activity. However, practical considerations such as opportunities to drink and access to a supply of fluid vary between activities. Some sports offer formal breaks (quarter- time, half-time) giving opportunities for fluid intake while other activities require you to learn to drink on the move (eg. Running, cycling, cross-country skiing). 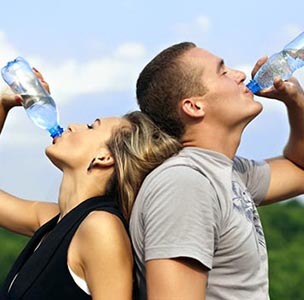 Water is a cheap and readily available liquid, and is often called the “best” drink for active people. However, it is known that carbohydrate intake improves performance during events of more than 90 minutes, providing the muscles and brain with additional fuel. Recently, a number of studies have shown that carbohydrate intake can also be useful for training just one hour. This certainly doesn’t hurt performance, although some people may need to calculate the cost or kilojoules involved. Sports drinks provide a simple and effective way to replace fluid and carbohydrate simultaneously during exercise. Of course, specialised products such as sports drinks are expensive and are best used in the right sporting situation. Some people use cordial or carbohydrate foods such as fruit, bars, confectionary or sandwiches to provide a fuel boost during exercise. A carbohydrate intake of about 50g per hour is generally recommended for prolonged events. Successful strategies are ultimately decided by individual preferences and experience.